Coldplay has released the music video for their new single ‘Life In Technicolor ii’, from the Prospekt’s March EP. 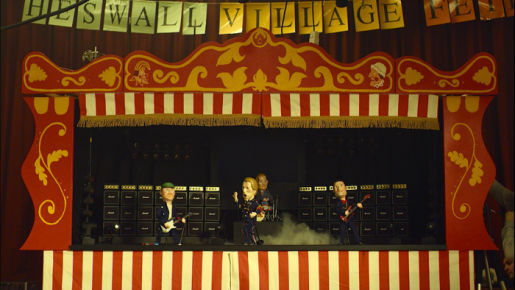 The British pop band appear as foot high puppets on stage at a Punch and Judy show, stunning the children and their parents. The Heswall Village Fete looks set to be just another of those boring events when the children’s entertainment turns extravagant. Coldplay’s stage gets bigger and bigger, the lights come on and speakers catch on fire before the final departure in a helicopter. Phil Harvey, known as the fifth member of Coldplay, appears in the video as one of the parents holding a video camera. Filming was shot by Dougal Wilson via Colonel Blimp with producer Matthew Fone, puppeteers Jonny&Will, director of photography Brett Turnbull, art director Andy Kelly, master puppet maker Nonny Beakes, stylists Michelle May, Natalie Marie Willis, Holly Dench. SFX was by Artem. Editor was Joe Guest at Final Cut. Post production was done at MPC by online artists Tom Harding and Stirling Archibald, and colourist Jean Clement-Soret.